Preloaded City Navigator® for Australia and New Zealand. Lifetime Maps (indicated by "LM" after model number on the box). 14.9 x 9.7 x 3.3 cm. Display Size (W x H). 10.8 x 6.5 cm, 12.6 cm diagonal (5). 374.5 g (13.2 ounces). Custom POIs (ability to add additional points of interest). "Turn right ON ELM STREET in 200 meters". Lane assist (guides to proper lane for navigation). Junction view (displays jungtion signs). Route avoidance avoid highways, tolls etc. Speed limit indicator (displays speed limit for most major roads in the United States and Europe). View upcoming points of interest along route. Streaming Spotify® & Pandora® music/media players: Yes. Compatible with Smartphone Link: Yes. The Zumo 595 LM now features Garming Adventurous Routing options for those winding, twisty, hilly, terrain-hugging rides that you love all displayed on a bright, glove-friendly 5.0 inch touchscreen that's easy to read and intuitive to use. Listen to Your Tunes While Traveling. Bring your music library with you for the ride by connecting your compatible MP3 Player or Smartphone and take control of the music with touchscreen controls on your display - you can even stream playlists from popular music services such as Pandora and Spotify! Rider Alerts to Keep You Aware On The Road. The zumo 595LM provides helpful alerts for sharp curves ahead, speed changes, railroad and animal crossing, school zones and more to enhance road awareness and encourage a safer ride. You are also notified when you may need to check state helmet laws or when you're about to go down the wrong on a one-way street. You also receive alerts for nearby red light and speed cameras. Fatigue warnings will suggest break times and potential rest stops worth considering for longer rides. See places of interest and milestones on your route without leaving the map view on your navigation display with the zumo Up Ahead feature and Easy Route Shaping lets you ad a point on your map to adjust your route if you have preferred areas or specific rows you want to ride on. Smartphone App for Added Features. The Smartphone Link App gives you the ability to know what's happening on the road ahead. Gain access to live weather radar and traffic information wirelessly on your zumo 595LM. You can also use the app to enable LiveTrack, which lets friends track your whereabouts whenever you're out on a ride. With a built-in trip computer and digital fuel gauge you'll always be able to easily estimate how much longer you can ride before you need to fill up the tank. Dynamic fuel stop alerts prompt you when it's time to refuel and show service station location options. The zumo 595LM also comes with a helpful speed limit indicator so you know when to slow down. A digital compass display and a database of motorcycle-specific points of interest (POIs) are also available to help you locate cycle repair services, dealers and more. You can also keep track of your service dates, mileage and performed maintenance on your bike with the Service History Log feature on your zumo. Your zumo 595LM comes with free lifetime map updates for the useful life of your device, so routes reflect the most up-to-date points of interest and maps available. Lane assist with junction view displays intersections and interchanges on your route to easy navigation through complex transitions. A brightly colored arrow on the zumo display let's you know which lane you have to be in for your next turn or exit. The zumo also comes with the TracBack® feature which let's you navigate the same route, in reverse, for your return trip. One TPMS is required for each tire and works with metal valve stems only. TPMS uses wireless technology to transmit the tire pressure data, letting you view it in real time right on your zumo display. 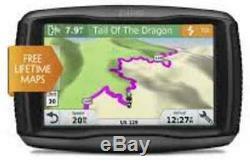 The item "Garmin zumo 595LM Motorcycle GPS Navigator Bluetooth Lifetime maps trip planning" is in sale since Wednesday, April 27, 2016. This item is in the category "Electronics\GPS". The seller is "bikerboy111111" and is located in Burwood. This item can be shipped worldwide.